Obituary for Glenn Frank Passage | Langeland Family Funeral Homes, Inc. Passed away Saturday, June 16, 2018. Glenn was born December 6, 1926 in Kalamazoo, the son of the late Frank Sr. and Laura (Boening) Passage. The family resided in Parchment where Glenn made many life-long friends. 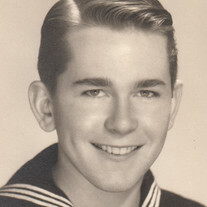 At the age of 17 he joined the Navy, serving in the Pacific. In his later years he became a proud member of the Tin Can Sailors Organization and attended reunions of his USS Parker shipmates. Glenn was a photo engraver by trade retiring in 1990 from Michigan Colorplate. Preceding him in death were sons Robert Frank, Steven Robert, and Joseph Richard Passage, as well as his brother, Frank Passage, Jr. Glenn is survived by his daughters, Carol Passage, Susan (Terry) Florian and Judith Connor; grandchildren Heidi (Eric) Venner, Meghan Florian, Holly Florian, Andrew Florian, Trevor Passage and Joseph (Caitlin) Passage; and great grandchildren Liliane and Eleanor Venner and Jaxon Passage. Cremation has taken place and private family interment will be in Fort Custer National Cemetery. The family will miss listening to Glenn tell his stories, especially the one about the last time the USS Parker "dropped the hook" in Charleston. Memorials may be made to National Association of the Destroyer Veterans (Tin Can Sailors) or a charity of your choice.